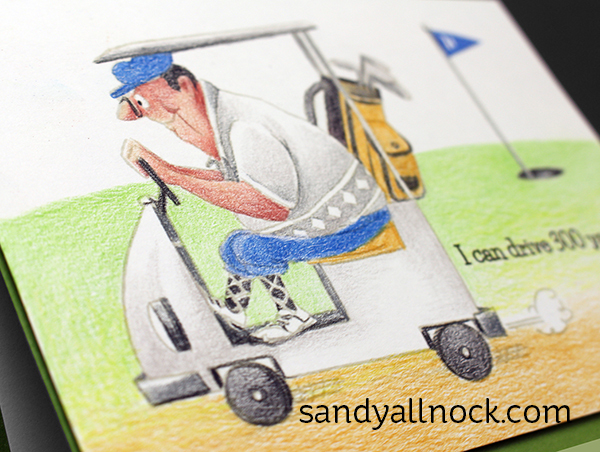 Male and female golfers will love this stamp set – Par-Tee Golfers….I decided to color the dude in the cart, and show you how I get a nice soft blend. But due to laryngitis at the time – you get Magical Monday, with a text explanation of tips below! This card reminds me of my Dad. He passed years ago, but oh man, was he a golfer. And a punster! I cut apart the sentiment stamp (gasp, I know, I know!) so I could put the second half of the sentiment on the inside of the card. Also – I shortened the flag pole by stamping the bottom and masking the top part, then moving it and lining up the pole, masking off the bottom. Watch the video below or click HERE to see it in HD on YouTube. To create the soft blends into white, use a kneaded eraser to soften it – works like a charm! Keep your pencils really sharp – love my Quietsharp electric sharpener. Use light pressure so you can keep adding layers without a waxy buildup. 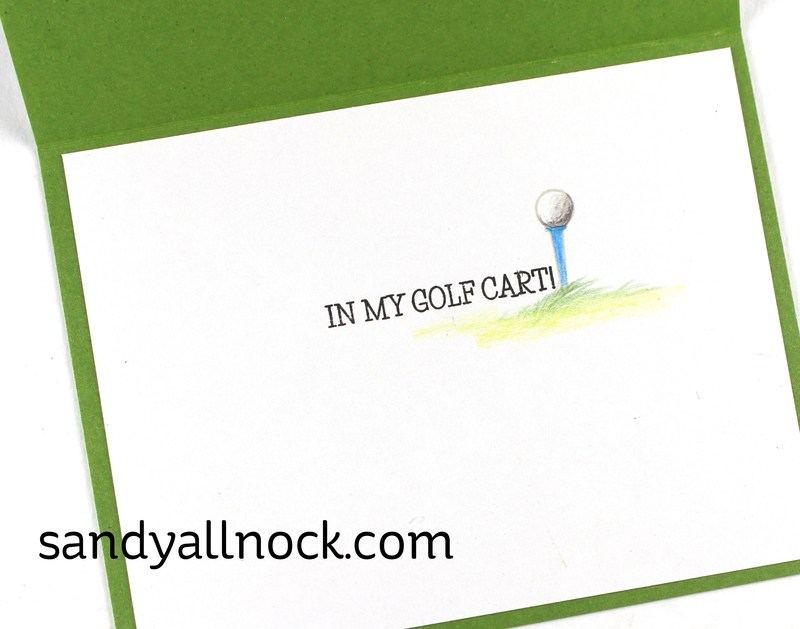 Inside of the card I used the second half of the sentiment, along with the teed-up golf ball stamp in the set. 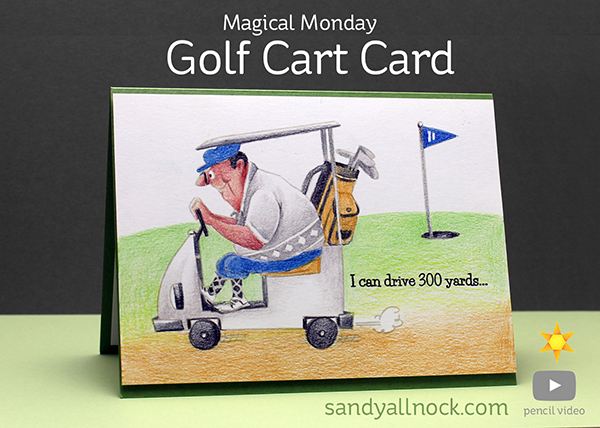 A while after my dad moved out on his own – to Myrtle Beach so he could golf all the time! – he called me and was hemming and hawing a bit. It took a while to get to the point….which was to ask me if it’s okay for a man to wear pink. I told him I thought it’d be ok, did he buy a shirt that someone teased him about? Not exactly. He washed some red socks along with his white shirts…….I suggested he take those to Goodwill and treat himself to some new shirts – but keep the pink undies. LOL! Miss him…. What a wonderful story to go along with your fabulous card. I am so awed by the backgrounds you create. You inspire me so often to sit down and play. Loved hearing the stories about your Dad, especially the pink clothes! Isn’t it wonderful to have memories like these?! My Mom will be gone two years on the 28th of this month and I miss her so terribly much. Right now I am going through a very bad time, had my thyroid removed about 6 weeks ago and it didn’t go well, I am facing some serious complications and I wish my Mom were here to comfort me. But, like you, I have some great memories of our time together, and the sure hope that we will be be together forever in heaven. Thanks for the smile today. Love your card and love your Dad story. Moments like that are precious. And your card is so cute. Your pencil coloring is so good – like all of your other abilities! Like your card and love your story. My Dad took up golf in his late 40s when he moved to Florida and after retiring from the Army. He loved golf. He played 3 days a week, on average, until he was 80 years old. I think golf helped to keep him young. I miss him too. Wonderful card and story. Hope you feel better soon. I always enjoyed Magical Monday. Love your card…. and your Dad Story. My dad was an avid golfer, so I NEED this stamp set 🙂 Sounds like our dads could have been part of a hilarious foursome. As my dad always said, “Never let the truth get in the way of a good story”… and he had a million of them. Miss him every day.